Diet-wise, I was good yesterday. I had a scrambled egg with salsa for breakfast; spinach salad with grilled chicken for lunch; a handful of almonds for a snack; a small piece of salmon, broccoli, and brown rice for dinner; and fruit for dessert. I say “good” because I like to limit my carbohydrates to one meal a day—dinner, in this case. It makes me feel better than having carbs throughout the day. I’m not following any particular diet, but just trying to eat in what I think is a healthy way. That means having more protein-based meals than carb-based meals. It turns out I’m not alone. The International Food Information Council Foundation reports that 50% of consumers are interested in including more protein in their diets and 37% believe protein helps with weight loss. A study in the May/June 2013 issue of the Journal of Nutrition Education and Behavior found that 43% of women surveyed are using the practice of eating more protein to prevent weight gain, and this strategy was associated with weight loss. But just because people are doing something doesn’t make it healthy. I asked Dr. Michelle Hauser, a clinical fellow in medicine at Harvard Medical School and a certified chef and nutrition educator, if it’s a good idea to eat extra protein and cut back on carbs. “If you’re eating more protein but you have a good mix of fresh fruits, vegetables and whole grains to make up the rest of it, that’s fine,” Dr. Hauser told me. One of the advantages of eating more protein-rich foods is that people who do it also tend to eliminate overly processed carbohydrates, such as white breads and prepackaged foods like cookies and crackers. Such foods are rapidly digested and turned into blood sugar, and tend to be low in healthful nutrients. But it isn’t necessary to eliminate all carbohydrates and focus only on protein. Such an eating strategy may have a short-term payoff for weight loss, but it may also come with some long-term risks. Protein is a critical part of our diet. We need it to build and repair cells, and make healthy muscles, organs, glands, and skin. Everyone needs a minimum amount each day. The Institute of Medicine recommends 0.8 grams of protein per kilogram of body weight. For someone who weighs 150 pounds, that means 54 grams of protein per day. Another guideline is to make sure at least 15% of your daily calories come from protein. How might more protein and fewer carbs in the diet make a difference for weight loss or weight control? “Protein takes more energy for you to digest than refined carbohydrates, and also gives your body a feeling of satiety,” says Dr. Hauser. Low-carb diets have been shown to help some people lose weight. But over the long term, too much protein and too few carbohydrates may not be the healthiest plan. This kind of eating pattern has been linked to an increased risk of developing osteoporosis. That’s because digesting protein releases acids into the bloodstream. The body neutralizes these acids with calcium—which can be pulled from bone if necessary. Eating too much protein also makes the kidneys work harder. In healthy people, this usually doesn’t pose a problem. But those with kidney disease or diabetes (which is associated with kidney disease) need to watch their daily protein intake so they don’t overload their kidneys. Depriving yourself of carbohydrates can also affect the brain and muscles, which need glucose (the fuel that comes from digesting carbs) to function efficiently. The fiber delivered by some carbohydrate-rich foods help bowels move. And remember that healthy sources of carbohydrates, such as fruits, vegetables, and whole grains, come with a host of vitamins, minerals, and other nutrients. But there are good carbs and bad carbs, as well as good proteins and bad proteins. Foods that deliver whole, unrefined carbs, like whole wheat, oats, quinoa, and the like, trump those made up of highly processed wheat or other grains. Lean meats, poultry, seafood, and plant sources of protein like beans and nuts are far more healthful than fatty meats and processed meats like sausage or deli meats. The good-bad thing can be confusing, so Dr. Hauser suggests a few simple principles. Pick the healthful trio. At each meal, include foods that deliver some fat, fiber, and protein. The fiber makes you feel full right away, the protein helps you stay full for longer, and the fat works with the hormones in your body to tell you to stop eating. 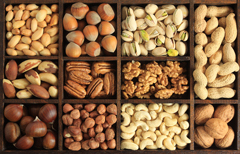 Adding nuts to your diet is a good way to maintain weight because it has all three. Avoid highly processed foods. The closer a food is to the way it started out, the longer it will take to digest, the gentler effect it will have on blood sugar, and the more nutrients it will contain. Choose the most healthful sources of protein. Good protein-rich foods include fish, poultry, eggs, beans, legumes, nuts, tofu, and low-fat or non-fat dairy products. These three strategies fit in with the Mediterranean and Dietary Approaches to Stop Hypertension (DASH) diets. The DASH diet includes 2 or fewer servings of protein per day, mostly poultry or fish. “The Mediterranean diet uses protein from fish as a centerpiece of a meal, and other meats as more of a component of a meal,” says Dr. Hauser. I had to ask if it’s important to spread carbs throughout the day or if it’s okay to limit them to one meal, the way I do. “If it makes you feel better to eat carbs at one meal a day versus spreading them throughout the day, that’s fine. You can scatter the carbs as you see fit,” says Dr. Hauser. So I learned that while I was “good” yesterday when it came to eating, I now know that I can be better.